A leading UK Bookmaker since 1934 and one of the most reputable, recognisable names in the Gaming Industry. 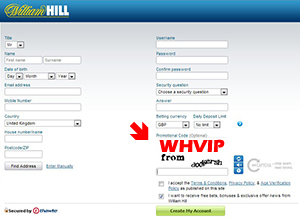 William Hill plc was floated on the London Stock Exchange in 2002 and in 2008 William Hill Online was established. Their name is linked with fair play and excellent customer service so you need look no further for good solid site to play! 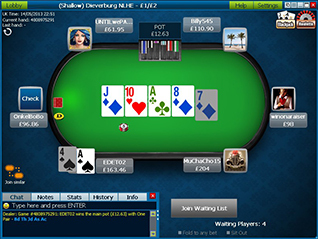 Ranked in the top tier of the iPoker network, where the widest range of games are played, and a firm favourite amongst online Poker players. When you first sign up you are welcomed by a friendly live operator who will take you through the process, sorting out any problems that crop up. These live operators are always on call making William Hill absolutely ideal for those new to online poker. William Hill are offering you a welcome bonus of 200% up to £1250 / €1400 / $2000 when you use the Bonus Code WHVIP. When you create your account, make your first deposit using the official bonus code WHVIP to be entitled to a new player bonus of 200% up to £1250 / €1400 / $2000. Held monthly you can take part, for free, and win electronic goods. There are laptops, digital cameras and Nintendo game consoles waiting to be won. Join in on the 1st of the month at 7pm UK, 2pm New York time. As a new depositor you will be able to play in four weekly $1000 New Depositors Freerolls held on Wednesdays at 7pm UK, 2pm New York time. Simple weekly races – the more points you earn, whilst you play on beginners cash tables, the higher you’ll rank. The top 200 new players will get a cash prize. There’s over $4500 every month to be won in free sit n go’s and tournaments (at 11am and 6.30 pm UK – 4pm and 11.30pm New York time) that are exclusively for new players. Note: You are considered a new player for 90 days from sign up. 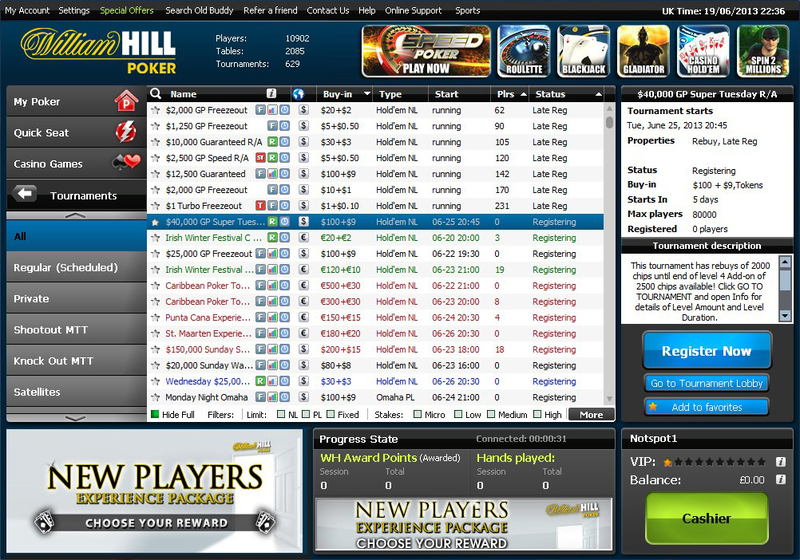 All these new player events are be easily found on the William Hill software through the WH New Player Zone tab. Launch Poker School TV from the WH website, for free, and get three tutorials called ‘Hold’em Basics’, ‘Beginner Strategy’ and ‘Advanced Strategy’. You’ll improve your poker skills and soon start playing like a pro. This is a really simple bonus to earn with no complicated formulas, every 425 WH Points you earn following your first deposit will be converted into $5. The bonus cash is released into your account in $5 instalments so, if you don’t get the full amount of points within the 90 days limit, you will have earned a fair amount of bonus and not lost out. The exact amount of WH Points you need to collect for your bonus, how many you have already earned and the time left to earn full bonus will be displayed by clicking the ‘bonuses’ tab in the menus on the William Hill software. Note: The bonuses are shown in the lobby in $ and then converted into £ or € at the current rate of exchange. WH Points are automatically earned as you play, the more money you put into the game the more WH points you’re awarded, it could not be simpler! In Tournaments you earn 25 WH points for every $1 in tournament fee paid. With Cash (ring) Games you earn 25 WH points for every $1 in rake contributed. There is a time limit of 90 days to claim your bonus. 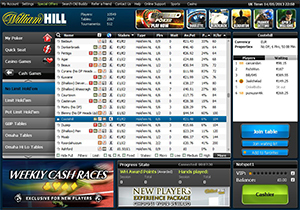 The No Limit Holdem tables are always popular at William Hill Poker, other options like Stud may be limited but you should be able to find a game or two at most times. Gold Tables are exclusive to William Hill. Play hard at the special gold tables and be rewarded with $1 for every 125 WH Points you earn – maximum $50. 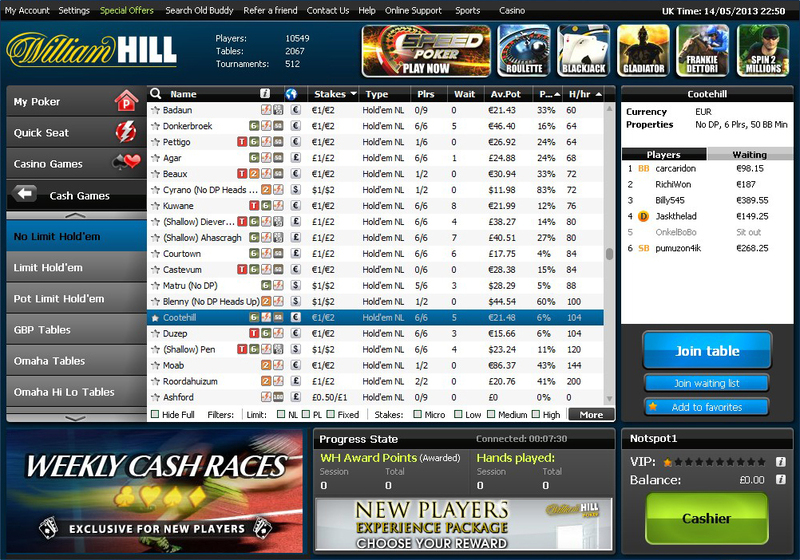 Find these William Hill Gold Tables through the software / WH Exclusives / Gold Tables. Remember to opt in via the William Hill website. 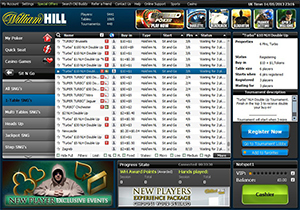 Speed Poker is the William Hill version of fast fold poker. When you join a table you will play each hand as you would on a normal cash table but when you hit the instant fold button you’ll be instantly seated at a new table, new players and with a new hand. 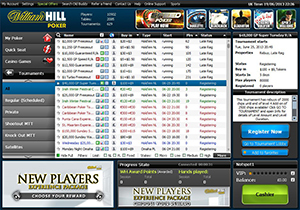 Click on the Speed Hold’em tab in the William Hill Poker lobby for super fast action. The Sit and Go’s at William Hill have a good amount of traffic 24/7, but something that should really interest the keen Sit and Go players are the Jackpot Sit and Go’s. As the name ‘Jackpot’ suggests the jackpot grows until won! Jackpot Sit and Go Tournaments are just like normal sit and go’s but, with added financial incentives. These four separate Sit and Go events are all about consecutive wins, with buy-ins to suit every budget with guaranteed jackpots, they are the jewel in the iPoker network crown. Fort Knox Jackpot – win six Fort Knox Jackpot events in a row and you’ll win $50000. Better still, in true jackpot fashion, if the jackpot is not won in a week the prize money is increased by $20000. Finish 2nd or 3rd in six consecutive games and you’ll get a tasty $750! The buy in to Fort Knox is $59. Maui Jackpot – the only 10 seater, has a $30000 minimum to be won for 5 x consecutive victories which grows by $6000 in the 1st week, if not won. 5 x 2nd or 3rd places will win $200. All this for just $6 to buy in! 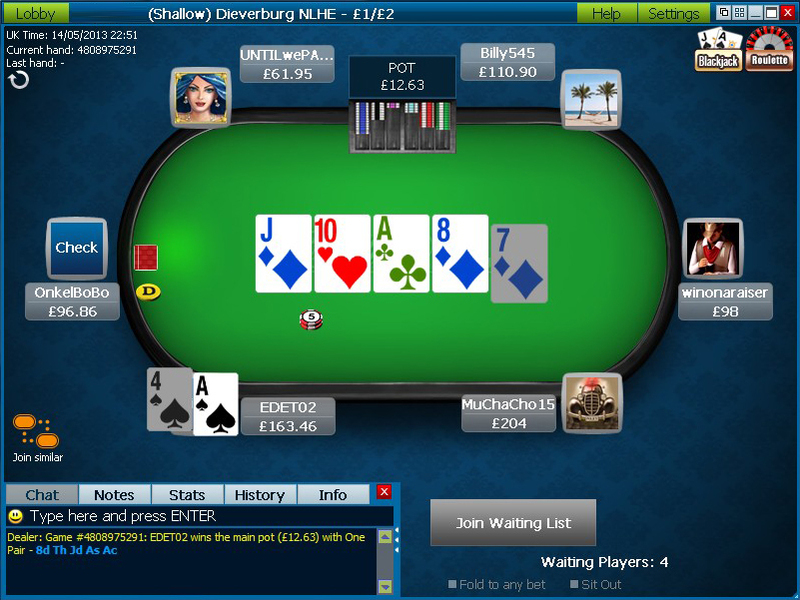 Dirty Dozen Jackpot – 12 players across two tables finishing with a heads up battle. Win four times in a row and you’ll walk away with $2000 – all for a tiny buy in of $2.40! All players are rewarded for their loyalty at the VIP Club, the more you play the greater the rewards. With every raked hand players build their WH Points up at a rate of 25 WH Points per $1, in real money tournaments you will receive 25 WH Points for every $1 you spend in tournament fees. You can redeem your points for cash or tournament vouchers. 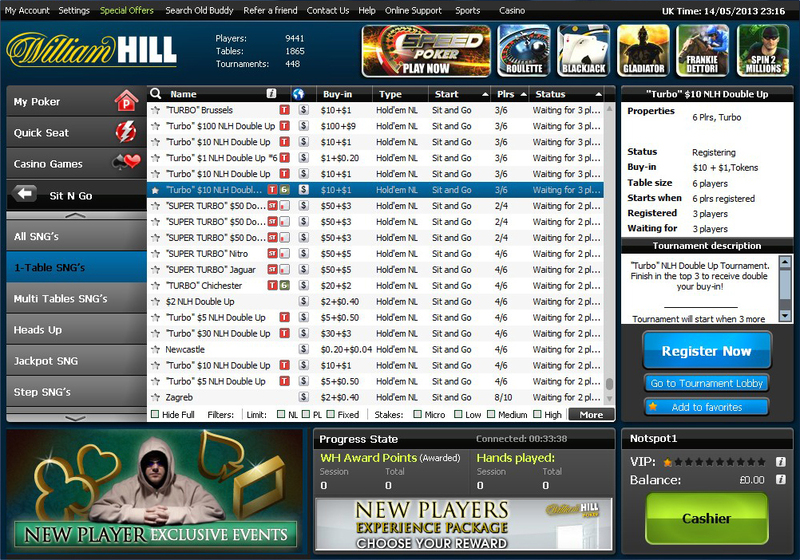 There are 10 VIP levels, depending on how many WH Points you have earned the day before, with exclusive VIP freerolls plus the Reward of the Month freerolls where you can win live poker event packages, packages to top sporting events, TV packages and cash. You can usually find leaderboards, or races, going on as part of a current promotion often linked to a live game prize package or large cash prize. New players can join the weekly cash races. Solid reputation for quick withdrawals. Email & freephone support (UK) and fax. 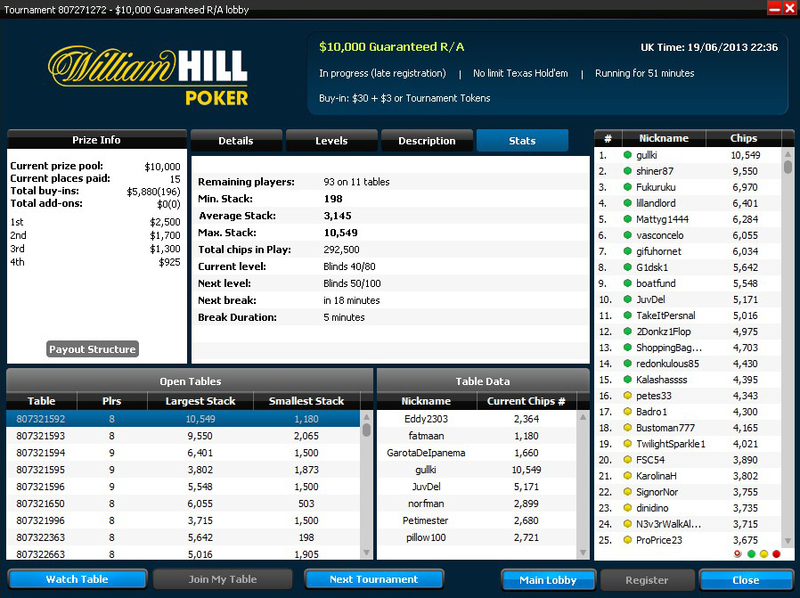 William Hill Poker last reviewed by DirectoryOnlinePoker.com April 2019. All rights reserved.